Folks, what we have here is fantastic artwork of the classic C1 Corvette sports car of the late fifties, early sixties, reflecting the early years of the neon lights. This particular artwork appears to reflect the artists impression with subtle modification such as incorporating the grille shared from the 1958/1960 models, on a 1962 body shell. Check out those large diameter five spoke wheels with deep offsets and the slight hint of the Corvette ‘racing flags’ along its flanks! The artwork in the back ground depicts the ‘Neon Lights’ of the 50’s as show in the artists impression of the Chevrolet Corvette wall clock mounted on a brick wall. 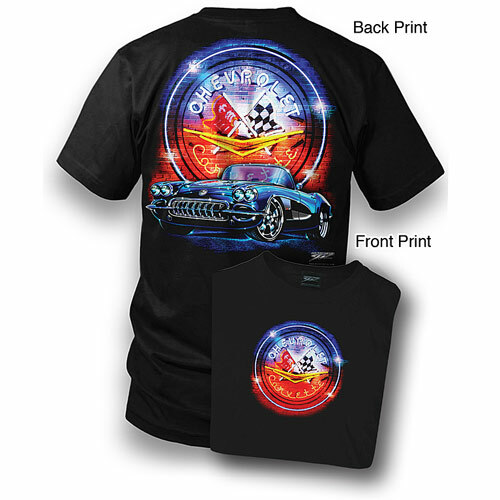 The artwork on the front of the Tee, is of the smaller image of the Chevrolet Corvette wall clock alone. Whilst, the rear of this cool Tee illustrates the complete artist’s impression of the C1 ‘vette. Four taillights appeared on the 1961, a treatment that continues to this day. Engine displacement remained at 283 cubic inches, but power output increased for the two fuel-injected engines to 275 hp and 315 hp. Power ratings for the dual-four barrel engines did not change (245 hp and 270 hp) but this was the last year of their availability. This was the last year for contrasting paint colors in cove areas, and the last two-tone Corvette of any type until 1978. Rare options: RPO 353 275 hp engine, RPO heavy-duty brakes and steering, 15x5.5 wheels, power convertible top. The 1962 model year was the last Corvette with a solid-rear-axle suspension that was used from the beginning. With two new engines it was also the quickest. Engine displacement increased to 327 cubic inches, but dual 4-barrel carburetor engines were no longer available. Hydraulic valve lifters were used in the base 250 hp and optional 300 hp engines; solid lifters in the optional carbureted 340 hp and fuel-injected 360 hp (268 kW) versions. Rocker panel trim was seen for the first time, exposed headlights for the last, until 2005. This was the last Corvette model to offer an optional power convertible top mechanism. Rare options: 24-gallon fuel tank), RPO heavy-duty brakes and steering, power convertible top, 15x5.5 wheels. 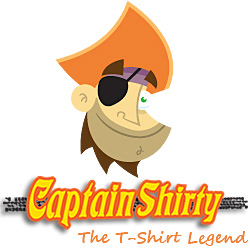 Tee shirt Colour: Available in Black only, with genuine GM Official Licensed Product Tag.